The small pink part of a pet's nail, called the quick, is where the nerves and blood vessels are. ✂ 【SAFE & DURABLE】: Our dog claw trimmer made of imports and hypoallergenic stainless steel ensures a safe and sharp cutting trim. 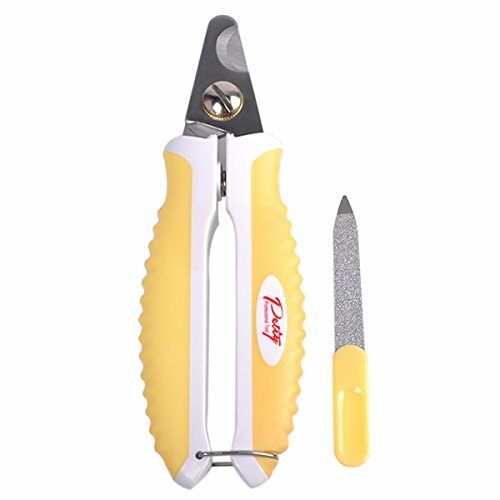 ✂【 PROFESSIONAL PAW NAIL CLIPPERS】: The pet clippers for small & medium and cats,with a razor-sharp stainless steelsemi-circular angled blade. You 'll be able to see what you're doing and help you determine how much you need to cut without going near the sensitive spots and avoid a bloody mess even without a quick sensor. ✂ 【FREE NAIL FILE INCLUDED】: You could use the nail file to file the rough edges of your pet's nails so that your pet's nail will be more smooth. It's a best gift for your pets after trimming. If you have any questions about this product by YOOHUG, contact us by completing and submitting the form below. If you are looking for a specif part number, please include it with your message.